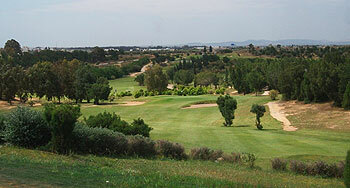 Tourists flock in great numbers to the golden beaches of Hammamet every summer but for those who choose to avoid the sand in favour of a round of golf then the resort’s an ideal destination as it also boasts three 18-hole courses, all of them designed by Ron Fream of Golfplan in the late 1980s. The two Citrus courses (Les Oliviers and La Forêt) are stimulating and demanding in equal measure, with each complementing the other whilst the course at Yasmine Valley – laid out just off the main road from Tunis to Sousse – offers a great deal more than the normal type of resort golf experience one might expect through an undulating landscape of pine and olive groves. Holes are routed in two returning loops around a large practice area and short Academy course sited close to the clubhouse. The 1st hole is the longest on the card, a 595-yard par five that doglegs round water to the right of the fairway. Like the other double doglegged par fives at holes 11 and 17, it serves notice that a strategic approach will offer rewards to those who think their way around the property. The old uphill par five 6th hole has been shortened to a 377-yard par four that now plays to a shallow pulpit green. This change was made to accommodate holes on the new Nicklaus course but, unfortunately, recent political events in Tunisia have put that particular project on hold for the time being. I have played the Yasmine course many times and it is one of my favorites despite it never being in great condition, though recently it has got a bit better. Lots of variety and the 17th is a zig zag par 5 where you really have to place your ball to get a score. Its a pity they changed the other par 5 into a par 4. The 3rd is a really 'tricky' par 4 to make you think. Well worth a visit. A round at Yasmine begins in fine style with a tee shot that plunges down to a distant fairway which then veers right past a lake on its way to the opening green. It’s the start of a thrilling rollercoaster ride that twists and turns, rises and falls every inch of the way from the opening tee shot on the first to the final putt on the last. I hadn’t been prepared for such changes in elevation so what a pleasant surprise this site turned out to be. The short par four 3rd hole became an instant favourite as it looks easy on the scorecard at less than 330 yards but it dog legs uphill all the way to a heavily-contoured raised green that overlooks large swathes of an extensive property – what a great hole to play so early in the round! Water hazards predominate at the closing two holes on the front nine but, thankfully, the back nine is devoid of such aquatic challenge, culminating in a very demanding finish at 17 and 18 (stroke index 1 and 3, respectively). The former is a double doglegged par five which gradually snakes uphill towards its intended target before the latter then decends to a home green that drops off severely on the right side. Apart from the spectacular downhill 7th hole, the par threes at Yasmine are a bit bland but the strength of this course lies is the half dozen par fours played between holes 5 and 11 – score well here and you just might post a decent figure overall. If you overlook the wacky greens on 4 and 16, you still have a very good course that will surprise and entertain in equal measure. Jim McCann.